How to use Groups in the Livingtree Directory? Here you will see the classes or teams you are connected to as a parent or student. 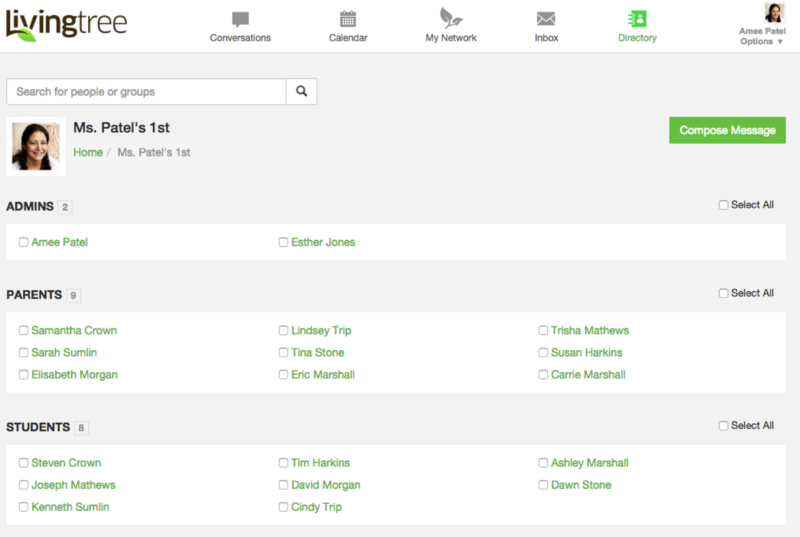 You’ll also see the groups you’re connected to as a member. Click on a group to view the teachers, parents, and students (if a class) or members and administrators connected to that group. You can click on an individual's name to view their profile information or compose and send a direct message. When you click into a group or organization, you will see the 'Compose Message' button in the upper-right corner. Select your recipient(s) and then click the 'Compose Message' button. To send a message to an entire group, click ‘select all.’ This is a great way to reach out to parents of a class for teacher gift planning.